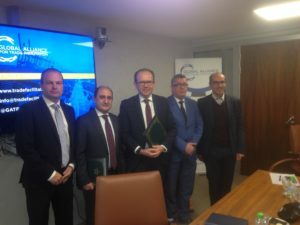 The project, which aims to optimise import and export processes in Morocco’s agri-food sector was developed through public-private consultation. The project is designed to reduce transaction time and costs for agri-food products by developing and implementing digital tools to improve processes that have up to now been paper-based. 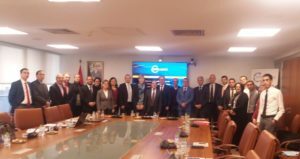 The trade facilitation project launched today will design and introduce a paperless, automated data exchange between the weigh bridges at Morocco’s main ports. The project will also support Morocco in introducing and sharing electronic phytosanitary certificates (ePhytos) with other countries. Digitising the weighing process is expected to reduce the clearance time for weighing by 25%. The introduction of ePhytos is expected to reduce the clearance time for imports and exports requiring this certification by two days. The Global Alliance for Trade Facilitation, which is supporting the project, is a not-for-profit venture which brings together governments and businesses as equal partners to identify opportunities to improve trade facilitation. The Alliance believes that international trade should be simpler, faster and more cost-effective, creating new business opportunities, enabling greater economic and social development and reducing poverty. Its work is designed to help governments in developing and least developed countries implement the World Trade Organization’s Trade Facilitation Agreement through working with public and private sectors as equal partners to identify barriers to trade and implement targeted reforms with tangible results, such as reducing delays at borders and removing unnecessary red tape. The Alliance is led by the International Chamber of Commerce, the World Economic Forum and the Center for International Private Enterprise—in cooperation with Deutsche Gesellschaft für Internationale Zusammenarbeit (GIZ), who are implementing the project with our Moroccan partners. The Alliance is supported by the governments of the United States, Canada, the United Kingdom, Australia, Germany and Denmark.